PRIME Minister Narendra Modi on Saturday said that past Governments did not had the courage to cross the border and kill terrorists, and hit out at Congress saying while the “chowkidar” showed guts to hit terrorist safe havens inside Pakistan, the grand old party wants to dilute powers of the Armed Forces. He also accused the Congress ofalwaysusingpovertyasamajor politicalweaponandsaidthebest remedy to eradicate poverty was to do away with that party. With Odisha all set to witness State poll with the general election in four phases on April 11, 18, 23 and 29, Modi also made a scathing attack at the BJD Governmentchargingitwithlacking “sahi niti & sahi niyat” (right policies or intention) for the development and urged people to elect a BJP Government in the State for faster growth through double engine. 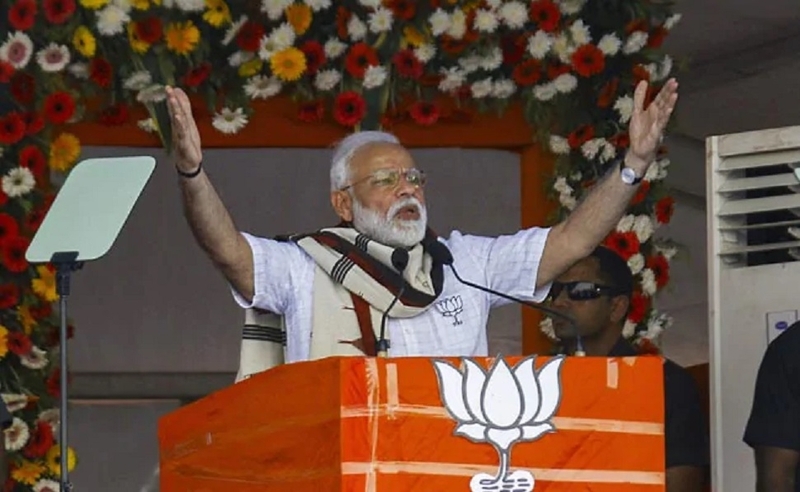 The PM addresse delection rallies in Sundargarh and Sonepur in western Odisha where voting for simultaneous assembly and Lok Sabha polls will take place in second phase on April 18. With a total of 21 Lok Sabha constituencies, Odisha holds importance in the ongoing Parliamentary election. Modihimselfis leadingtheBJP party to corner maximum number of seats in the State, from where BJP had in 2014 managed only one seat of Union Minister JualOramfromSundargarhwhile BJD had bagged the rest 20. The BJP is also making efforts to gain power in Odisha ending 19 years of BJD rule and on several occasions BJP party leaders have claimed to repeat Tripura in Odisha. BJP had ended 25 years of uninterrupted CPI (M) regime in Tripura last year and set up its own Government.